I dislike the expression, ‘I dumbed-down my resume for this job,’ because I think it more offensive than it is accurate. To get the job we need requires a resume to be fine tuned often. At the end of my Peace Corps service we went through a Resume Seminar on how to approach the job market after our service. It was a lot of repetition for us older volunteers but the youngins ate it up. Many of the young volunteers have never had to deal with the real world and job hunting because they joined Peace Corps fresh out of college. I do not envy the shock and bitterness that they are currently dealing with. Like me, many of them just expected to get into their desired jobs out of school, especially with internships and Peace Corps on their resumes, and they’ve been hitting some unsavory walls. The average employer looks at a resume for approximately 30 seconds to a minute. If you don’t fine tune that resume to ‘POP’ in that time frame then you’re most likely getting passed over. You almost have to be a salesman (or woman) during interviews. Some of the best advice I’ve received is to find out what they’re searching for at the job, pretend it’s a problem that you have the exact skill set to fix, and then interview with that mentality. It shifts the focus from ‘why I’d be a good fit please hire me I am desperate’ to ‘you have a problem that I can fix, let me tell you why I’m the person that will solve this for you.’ Employers respond really well to the can-do attitude. This takes me back to the ‘dumbing down’ of the resume. I don’t think people that work menial jobs in retail or similar professions to be unintelligent sloths as they (we) are often depicted on TV. I think people who work retail are realists and they know you have to pay the bills while pursing the things you want most. There are the few workers that are perfectly content with a retail lifestyle and who actually enjoy customer service. Happiness in life boils down to aspiration and no one can tell you what does or does not inspire. We need to shift the paradigm in which we judge those around us. We all have those friends that are ashamed to tell people what work they do in public and we shouldn’t make that the focus. Instead of saying what you’re doing presently as an answer try responding with what you’re aspiring towards. It’s a real shame I can’t tell anyone at work that I’m just another ship passing in the night. 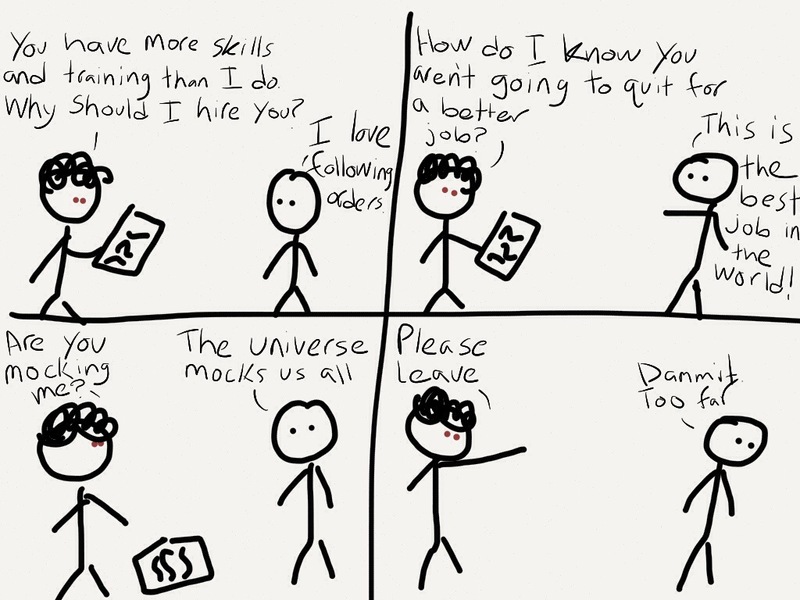 The job market wouldn’t be such a mess, especially for overqualified people, if those of us with advanced degrees and work experience would stop picking up these menial jobs and then quitting just after we’ve been trained as we move on to something better. This is why it’s so important to tailor your resume for the desired skills and cut out the excess, or eventually we’ll never get these filler jobs.